Operate in multiple markets? Want to dominate each one? Several years back I noticed how some large websites were dominating the search engine results for major keywords in tons of cities. If you Google “investment properties in Portland”… you see Loopnet.com ranked #1. But now try to Google “investment properties in [enter any city here]”… and you’ll likely see Loopnet.com ranked in the top few results on every single city you search for using that phrase. We studied why this was happening and reverse engineered how to do this for a real estate investor’s website looking for seller leads, buyer leads, tenants… any type of lead. We call it our “Loopnet Strategy”… but in more basic terms it’s simply building City Specific Landing Pages. I don’t want to over-complicate this. It’s a VERY easy concept and easy to implement. It just takes time and following a simple strategy. But at the root of the strategy is the way people search Google. If I’m a motivated seller in the city of Houston… I’d go to Google and likely type in some sort of search phrase that has the local city name “Houston” in the search somewhere. Because in a searchers mind… they’re likely to find a buyer who buys Houston homes if they make sure they include their city in the search. So if you’re in the Houston market… you’d likely want your home page to be focused and optimized for a phrase like the one above for those Houston searchers. But… what if you buy houses in other cities around Houston as well? Like Katy, TX, or Deer Park, or Stafford, or Humble… you get the idea. But most investors are losing out on precious traffic and leads because their website is too focused on just 1 city or location. That’s where creating the City Specific Landing Pages comes in handy. As I describe above… a searcher (seller, buyer, tenant, lender, etc.) tends to localize their search by putting their location in the search. This could be their city, their state, county, etc. So if we know this… shouldn’t we have a specific page on your website optimized for each market that you operate in? 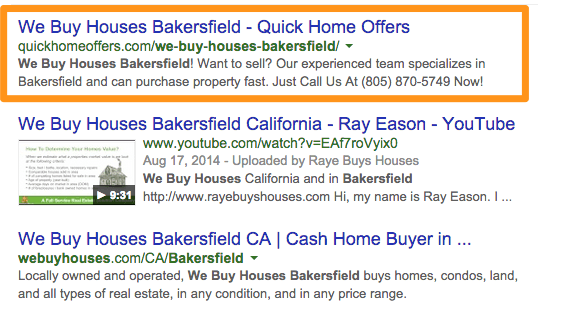 As an example, when I type in “we buy houses Bakersfield“… you’ll see that the #1 result on that page is a Carrot members site who created a city specific page for the Bakersfield market. And it’s not their home page, it’s a city specific page they created and optimized using the Carrot SEO Tool built into our system. That page generates leads for them every single month… month in… month out… without any extra work other than creating the page, tweaking the content, and doing a good job on the SEO on the rest of their website. But… don’t stop with 1 city specific page. Our suggestion is to pick the top 10-15 cities, counties, etc… that is in your focus area and create a location specific page for each one of those markets to give yourself a better chance at ranking well for those specific cities. The particular customer above has page 1 rankings for multiple cities all because they took the time to create pages for each city… spend some time tweaking the content… and doing a good job on the SEO on their overall website. In some cases we’ll see Carrot members who generate 60%+ of their website traffic through their city specific landing pages… not their home page. That’s how you really ramp up your traffic as an investor… by not focusing all of your SEO eggs in one basket (on one page with 1 or 2 keywords). Who Should Set Up City Specific Landing Pages On Their Website? Really, anyone who invests in multiple locations should have pages setup for each city they invest in… if you want to give yourself the best chance at generating more traffic and leads across your whole target area. If you have a main city you invest in… but there are also other cities around that location you’d buy houses in… you should create city specific pages for each city. If you’re a regional investor and invest in multiple states… you should have a page for each state… then pages for each major city you’d buy in in each state (this is an advanced strategy that we can do for you as a Carrot member through the service on this page). In the end, you’re leaving a lot of potential traffic and leads on the table if you’re just leaving your lead generation up to your home page and 1-2 main keywords. First off, it’s really straight forward to setup city specific landing pages on your Carrot website. Here’s a tutorial on our help site that walks you through the process. Make sure to tweak the content on each city specific page so 30-40% or so of the content is different than any other city specific page on your site. Update the page with pictures in that specific location, content about that city, etc. It may take 10-20 mins per page to set these up yourself. OR, we can take the load off of your hands and do the work for you. Submit payment on this page. We’ll create 10 city specific landing pages for you. We do some basic SEO research to see if there’s anything we need to do to better optimize for those locations, then we build out your pages on your website, our copywriter will dive in and write you custom content for each page so you won’t have to touch a thing on the content, and last create the links in the sidebar! This all takes between 5-10 business days depending on how much we have on our plate at the time. Please log in to your account to start this service.